Learn more during APQC’s complimentary August HCM webinar: Ericsson’s HR Global Operations Journey –Transitioning from a Regional Shared Service to a Global Center of Excellence Model. Register today. Can you describe Ericsson’s HR Global Operations Delivery Model? HR Global Operations is an integral part of the Human Resources unit within Ericsson. 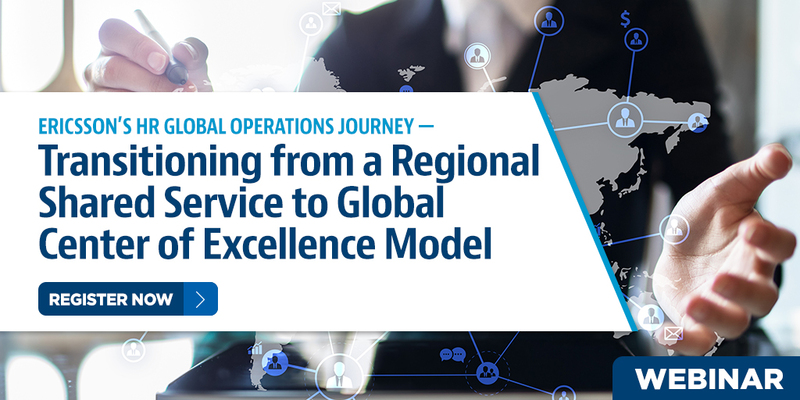 The model was established almost 20 years ago when a decision was made to move to a global set up with regional shared service centers (SSCs) covering different geographies and supported by global shared services centers (GSSCs). We had six SSCs regional centers— located in Stockholm, Dallas, Madrid, Beijing, New Delhi, and Manila. Our GSCCs were in New Delhi and Manila. So, for example, all time and payroll professionals previously reporting to the various regional SSCs were moved into the same global team. Why did Ericsson adopt this model? Ericsson is a global company, acting globally with global policies and procedures. So, more and more, our ways of working are reflecting this global mindset rather than a local way of delivering. HR specifically decided to adopt this global way of working to better respond to our internal customers, to improve efficiency though global synergies, and to develop a global team culture within HR—one that shares best practices and works on projects across geographies. But this model does not neglect local needs. We adjust our global policies to local needs, primarily based legal requirements. The more we globalize, the more we standardize our HR activities. Yet, our systems do allow several grades of freedom and flexibility per business needs. What benefits has Ericsson realized from using this model? The model is paying off in terms of having better global end-to-end processes which gives us big efficiencies. We have a truly global organization with employees covering all disciplines within HR and delivering services almost 24/7 for our almost 100,000 employees all around the world. This, in conjunction of our vendor consolidation strategy, is helping secure the needed quality in our deliveries. More importantly, for our employees, this model is giving all of them the possibility to enrich their knowledge by being trained, sharing practices and participating in regional/global projects outside of their normal activities. What are some challenges that Ericsson deals with in using this model? There are a lot of change management activities involved in implementing this type of model as we are looking for global efficiencies that may imply no local presence. This is difficult to understand from a local perspective as we need to secure the same or a better level of quality in our deliveries no matter whether the activities are done locally or remotely. Within this model, you head up the Global Center of Excellence for Time, Payroll, and Benefits. As a Center of Excellence Head, what are your core responsibilities? It is my honor to lead the Center of Excellence Time and Payroll within HR Global Operations. In our global unit, we carryout processes and deliver payroll and time activities for all geographies around the globe. As of today, we run payroll for 128 countries. And we run it from different locations, some with our own “in country” teams, others in “remote” mode. That means 95 percent of all payroll processing for our employees is delivered from our unit. The rest will become part of our unit as our journey progresses. 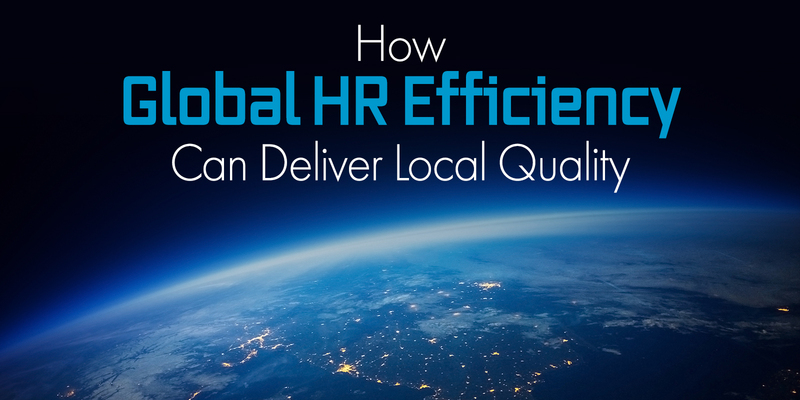 You also head up HR service delivery in the South EMEA region (Iberia, France, Italy, South East Europe, Middle East, North Africa, Sub-Saharan Africa, Saudi Arabia, Gulf Countries, Turkey and Israel) and the LATAM region. As an HR service delivery leader, what are your core responsibilities? As we have some former regional SSCs in six locations, one of them being Madrid, we have teams from different CoEs delivering their services from this location. I’m securing all activities that are delivered based on our service delivery/service level agreements (SDAs/SLAs) in all of our delivery disciplines. It is my role, as well, to secure the support of our employees as well as the support our employees give to remote managers on local employee-related actions. What advice do you have for organizations looking to globally integrate/consolidate HR service delivery? When it comes to service delivery, we need to understand what type of activities can be performed locally versus remotely. Everything considered as country-agnostic is and should be analyzed so that the processes can be globally defined, designed, and treated. This will enable a great number of efficiencies. In addition, the more we can automate the transactional steps in all of these global processes, the more efficiencies that can be gained. Every company is now very much considering this kind of automation. Learn more about Ericsson’s global HR service delivery model during APQC’s complimentary August 16, 2018 HCM webinar. Claudia Petrocchi, Ericsson’s head of International Mobility CoE and acting head of End-User Support, will provide attendees with concrete examples of organizational challenges and best practices faced during the transition from a regional to a global model, with an emphasis on change management.